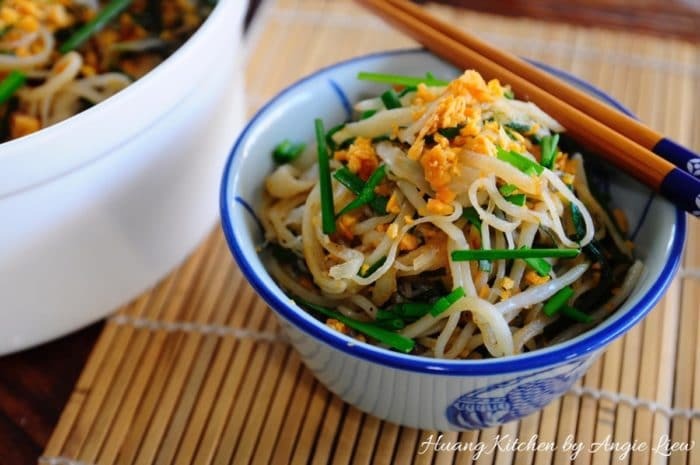 Chinese always celebrate with noodles to signify a wish for a long and happy life. All the more so if teochew noodles otherwise known as longevity noodles (Mee Tiao 潮州面条) are used as they are a symbol of long life. 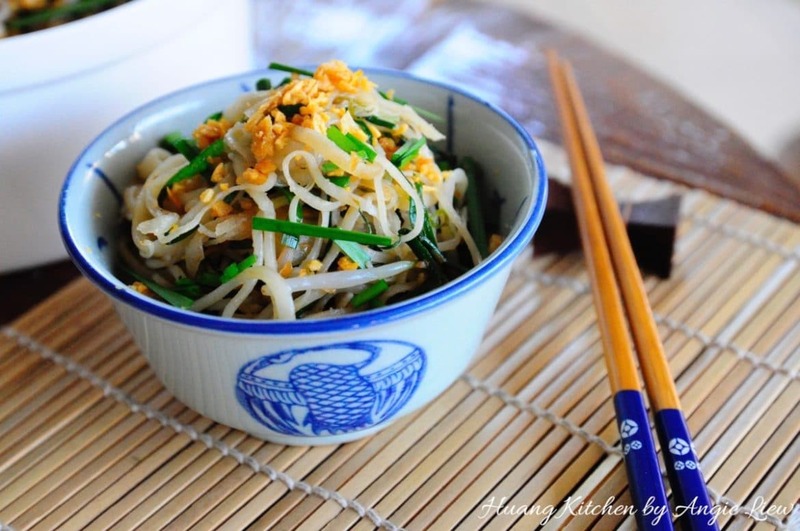 This stir fry teochew noodles dish is very special and close to my heart as it brings back fond memories of three very special ladies in my life. 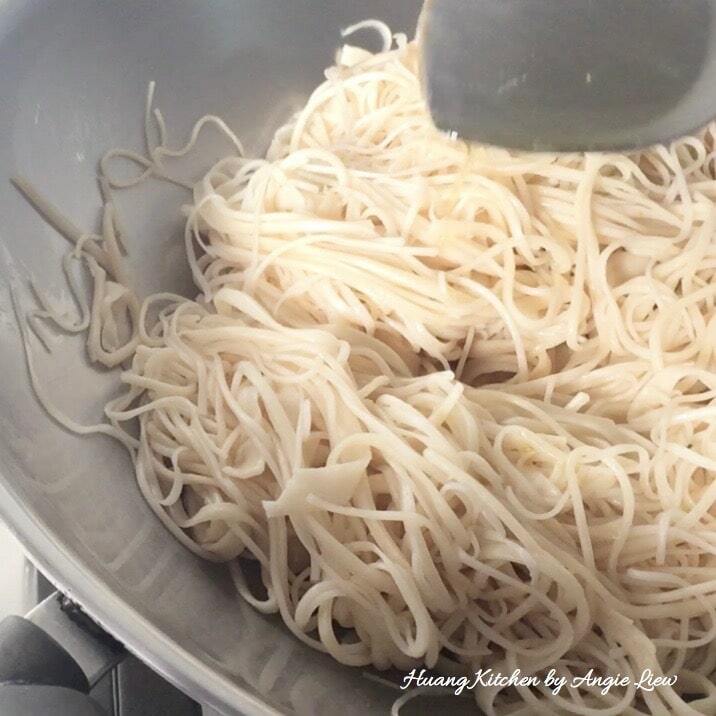 My beloved grandma, mum and mum-in-law would always diligently cook this noodles in all our family celebrations and special occasions. It’s indeed one of our family MOST treasured recipe! 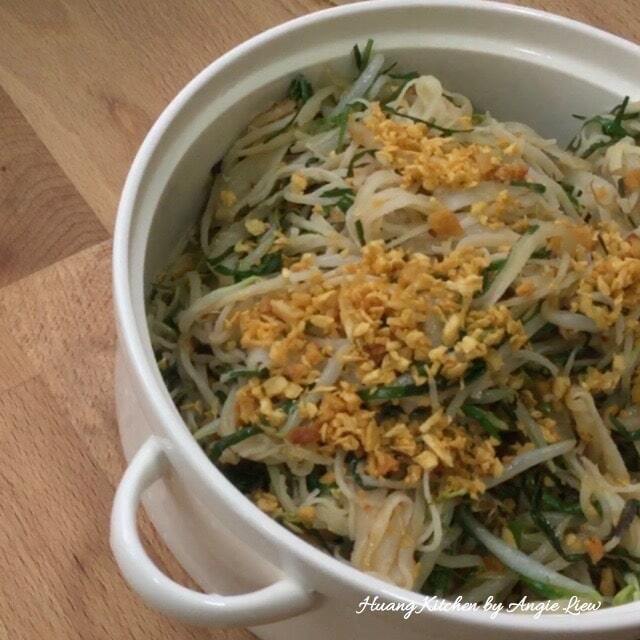 This teochew noodles dish is very simple to cook and has only four ingredients in it. We need a fair bit of aromatic garlic, a handful of beansprouts and chinese chives and lastly the most important, pork fat. The noodles is unlike others as it is first stir-fried on its own in light lard oil until they sear properly. This can be quite laborious but the outcome is truly worth all the effort. Only then do we toss in the beansprouts. Another important ingredient is chinese chives. 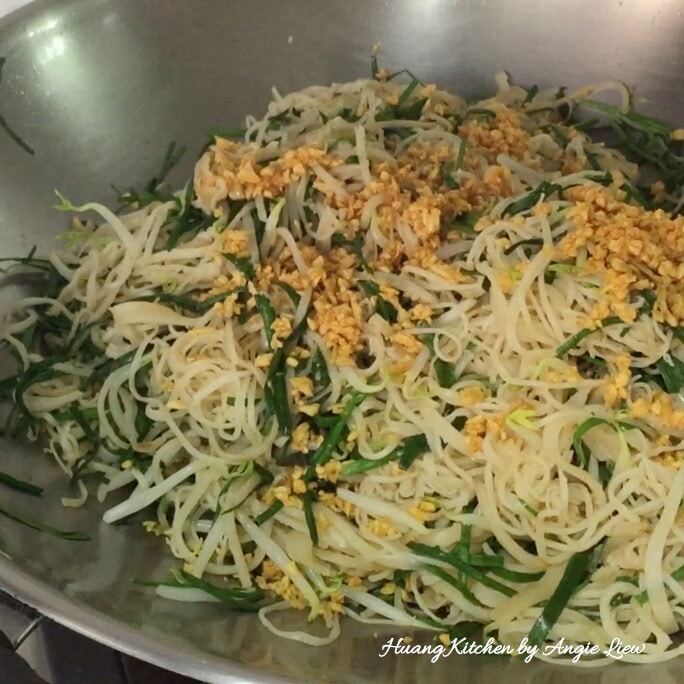 Without chives, the stir-fried longevity noodles is never complete so a handful of chinese chives is added as the last cooking step before garnishing with fried and chopped lard pieces and aromatic garlic. 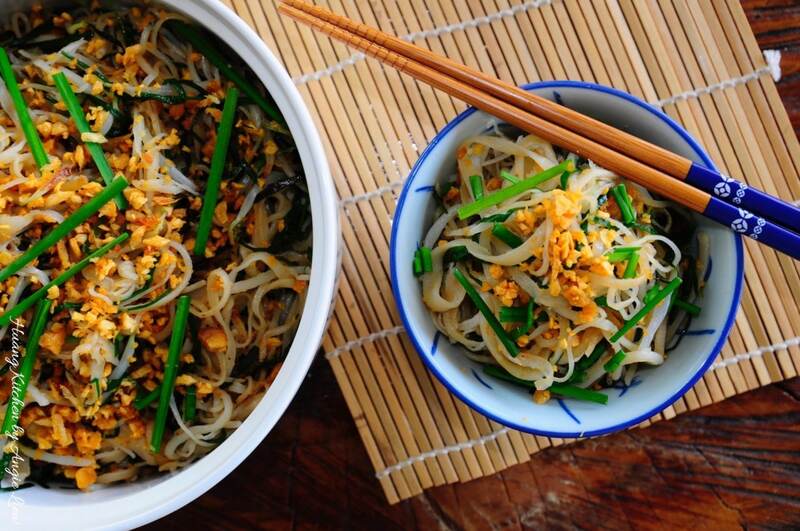 This classic teochew noodles dish is very simple to cook and has only four ingredients in it. 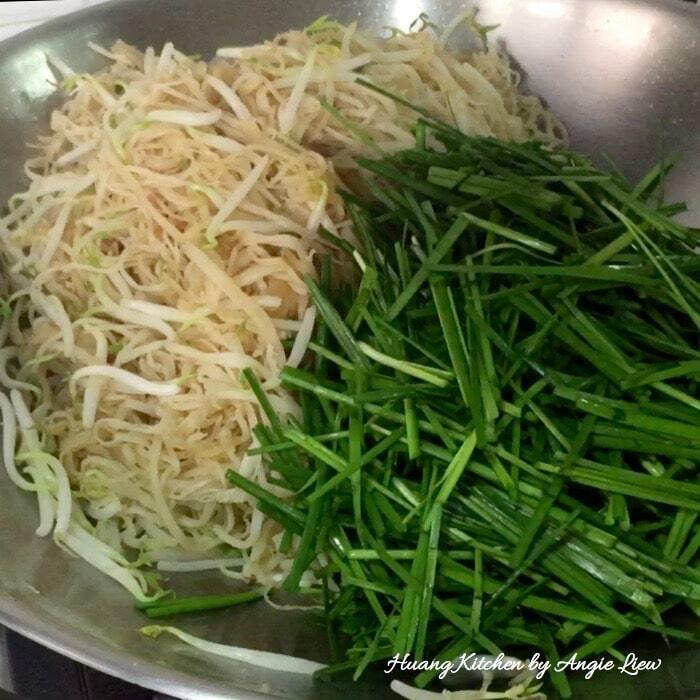 Aromatic garlic, a handful of beansprouts and chinese chives and lastly the most important, pork fat. First, peel and chop garlic. Set aside in a bowl. 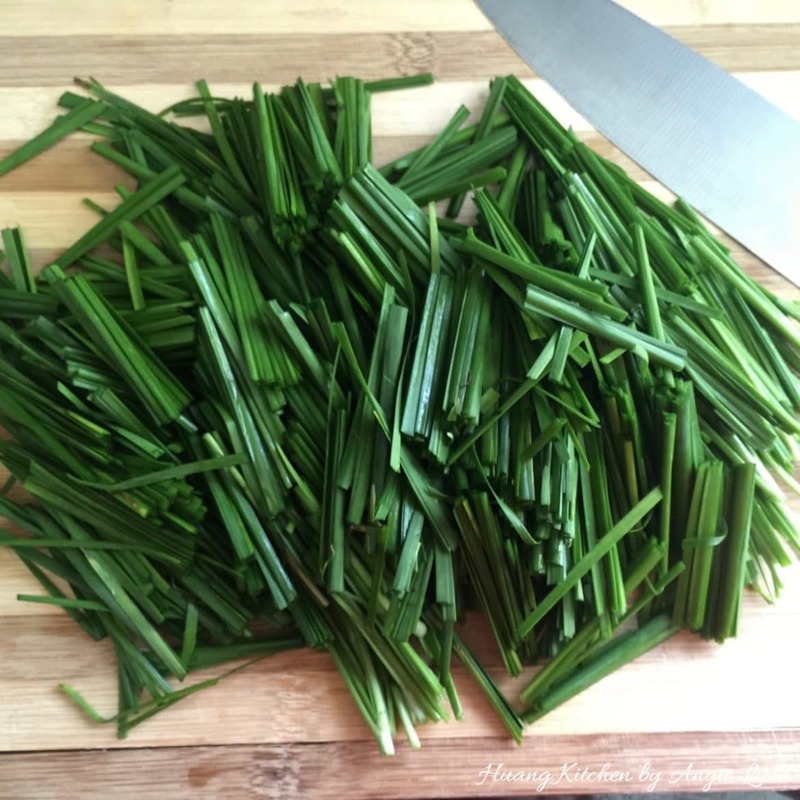 Then rinse, drain and cut chinese chives into 2 inch sections. 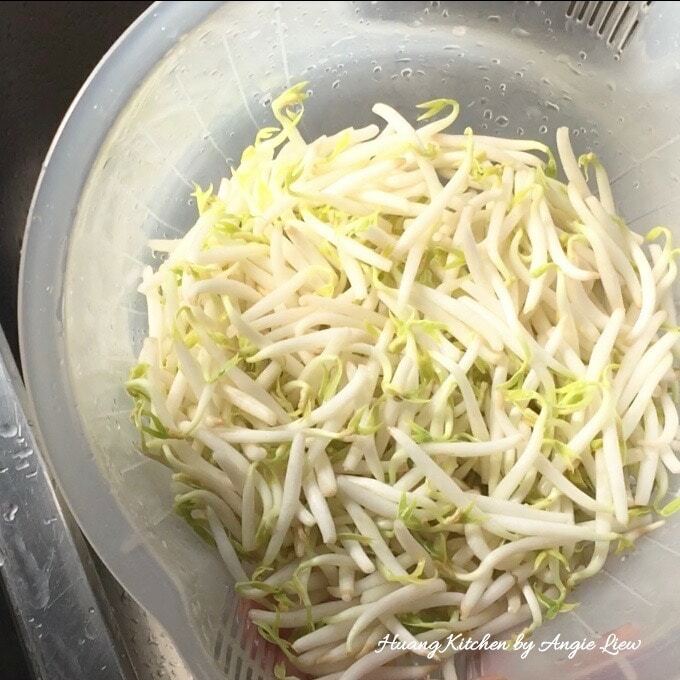 Also rinse and drain the beansprouts. Next, loosen and cut to shorten the strands of noodles for easier stir fry. (Optional). Then, bring a large pot or wok of water to a boil. Add the longevity noodles and cook for 2 minutes. Be sure to consistently stir the noodles to prevent them from sticking. Do not overcook the noodles. 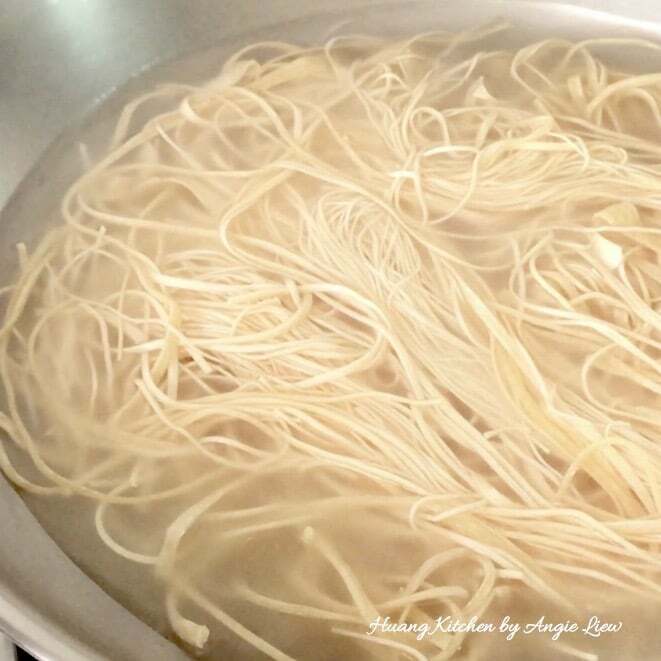 Drain the blanched noodles in a colander and rinse in cold water. Then, drain the noodles. 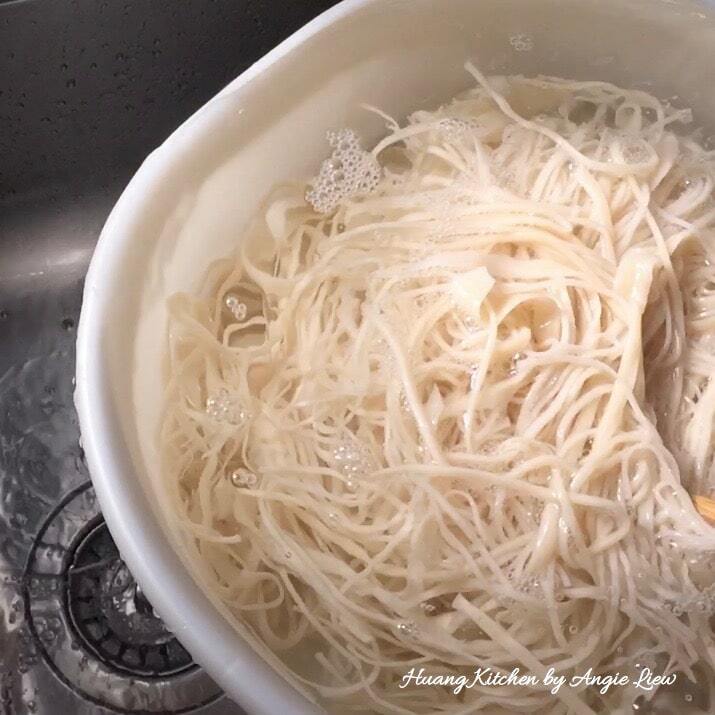 Repeat the process of rinsing and draining the noodles for a second time. This is to remove any excess salt on the noodles. Shake well to remove water and set aside. Lightly rinse pork fat in some salted water. Then place the pork fat into a heated wok. Set on low to medium heat and fry the pork fat. The fat will slowly start to melt into a puddle of oil. Check to make sure not to burn the crispy lard pieces (bak ewe phok/ chee yau char). Otherwise, they will taste bitter. Stir occasionally to ensure even cooking. 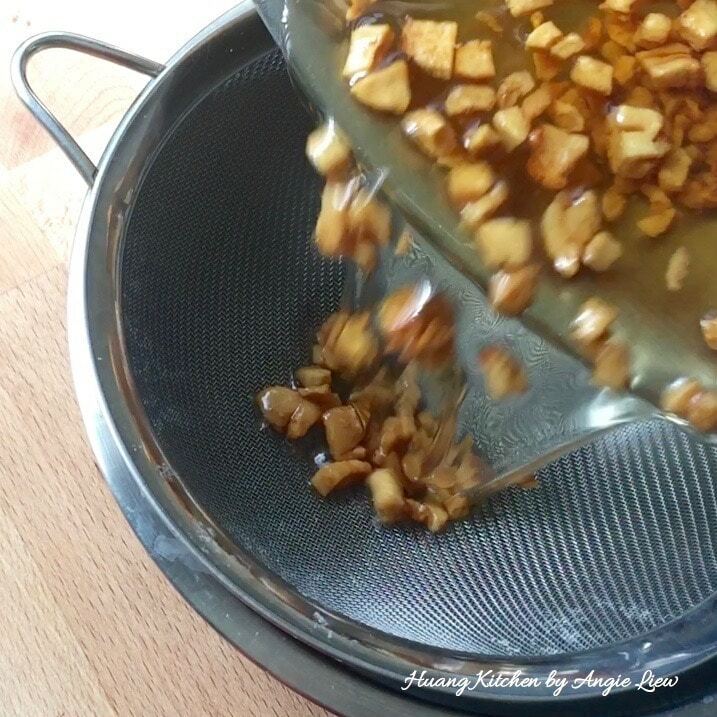 Strain the oil through a fine-meshed sieve to separate the oil from the lard pieces. 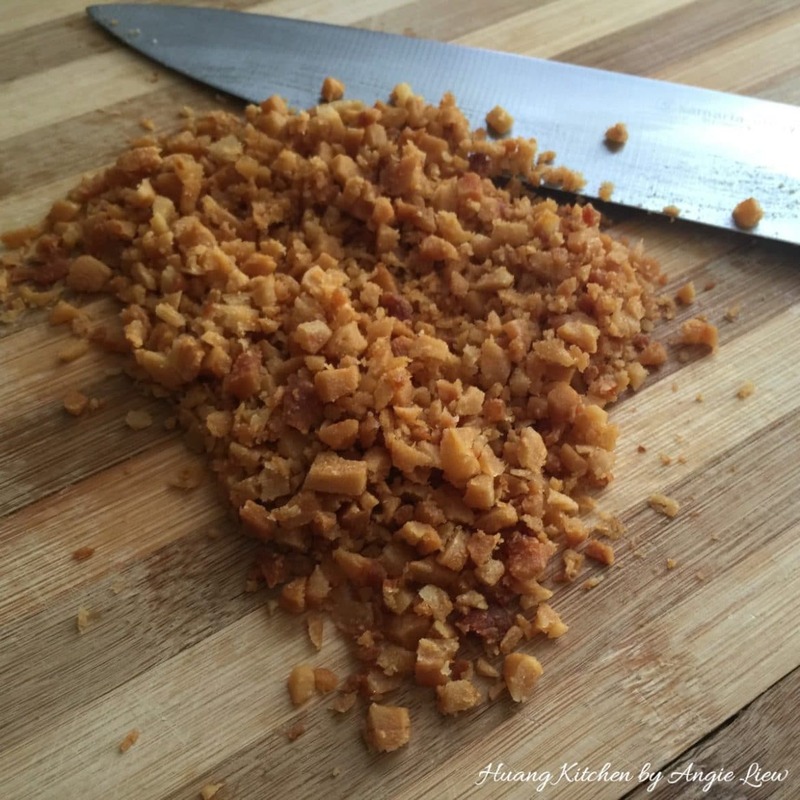 When cooled, chop coarsely the crispy lard pieces. Set aside and we're ready to fry the noodles! To fry the noodles, first heat up the strained lard oil. Add the chopped garlic and fry till light golden brown and fragrant. 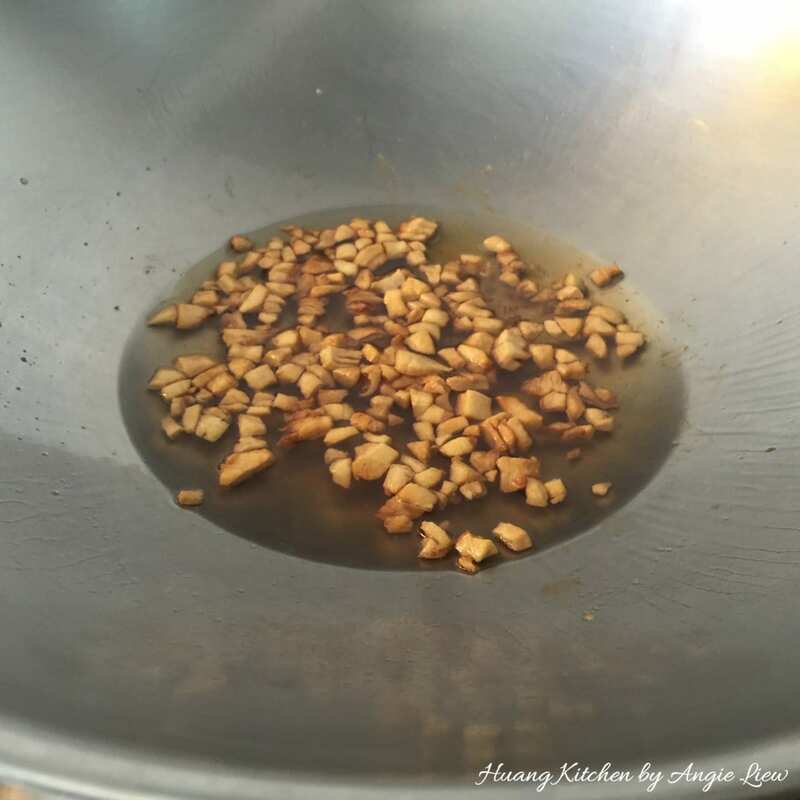 Remove from heat and separate the fried garlic and oil using a strainer. 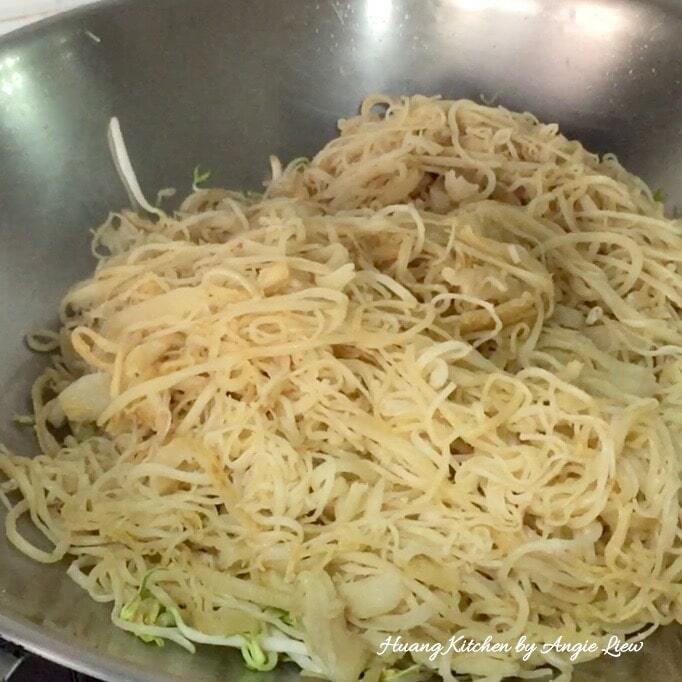 Using the same wok, place the blanched noodles and stir fry in the garlic oiled wok. Make sure there is no fried garlic in the wok. Otherwise, the garlic will render the noodles bitter. 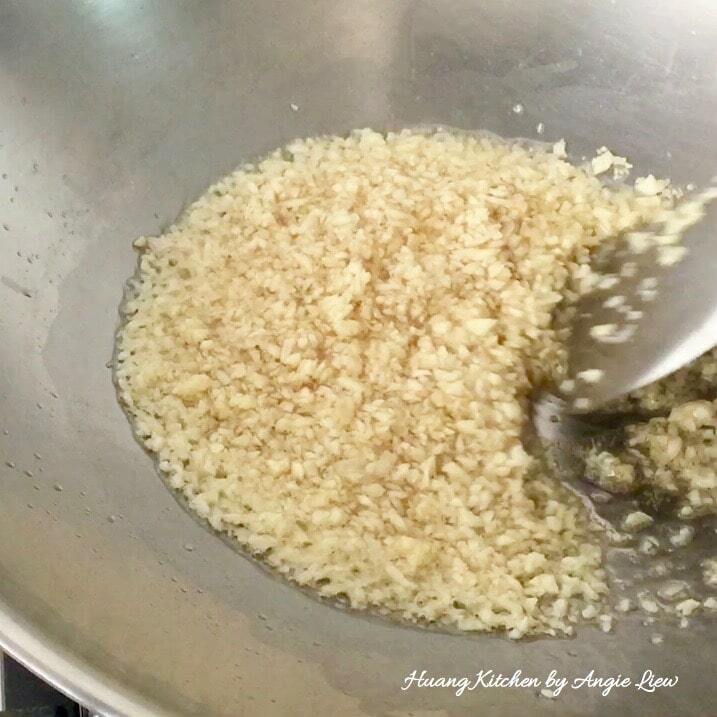 Add a little of the garlic oil in batches and continue to stir fry so that they don't clump together in the wok and fry till the noodles turn slightly brown. At this point, we are ready to add the drained beansprouts. Briefly stir fry to mix the beansprouts into the noodles. Then, add in the chinese chives. Stir to mix everything together. Do not overcook the chinese chives. 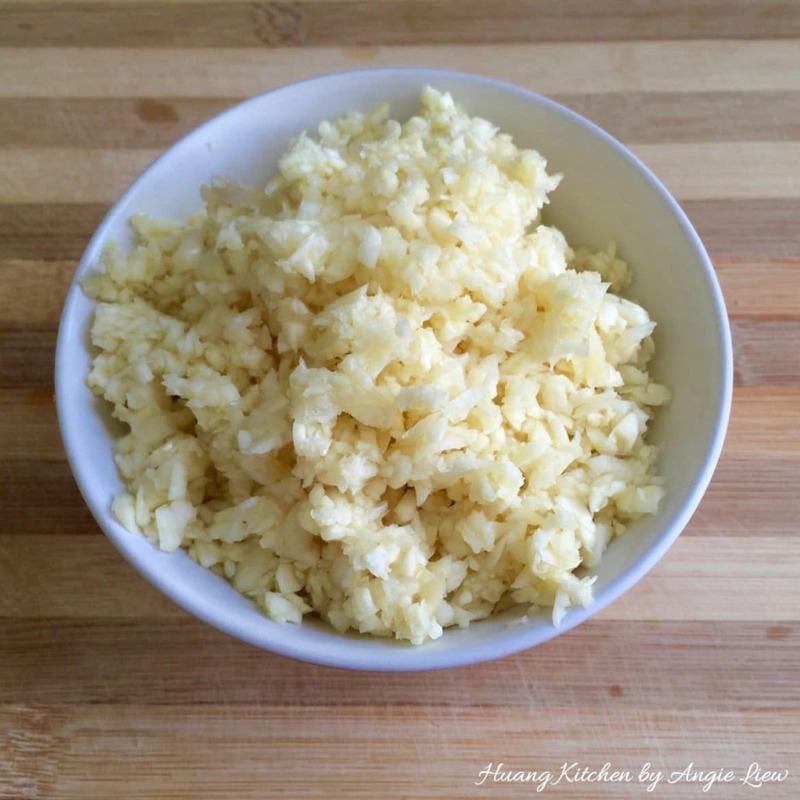 Next, toss in the chopped lard pieces and continue to stir fry to mix well. 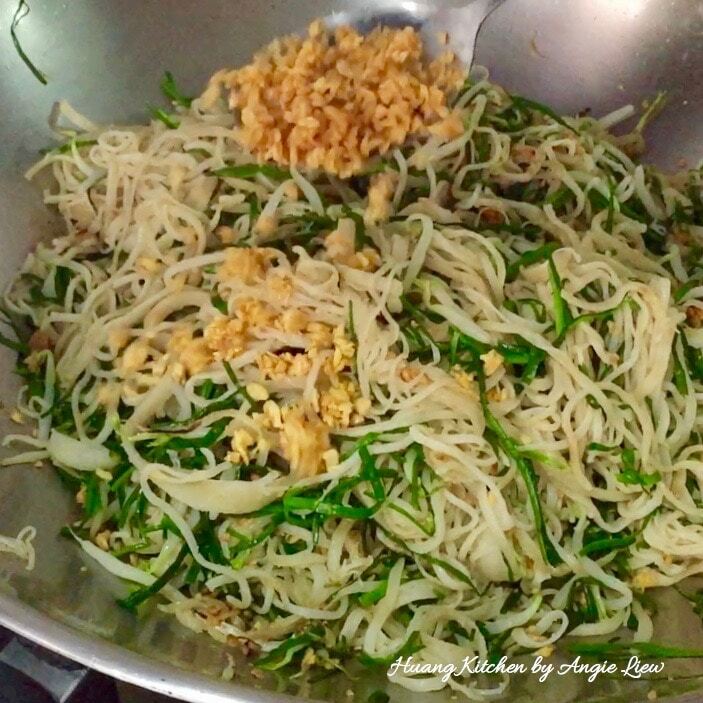 Lastly, spread over the noodles with the fried golden chopped garlic and lightly mix together. And we're done! Dish out to serve. Garnish with additional fried garlic. This noodles can be served any time of the day. It tastes equally good, served hot or cold. As always, ENJOY! 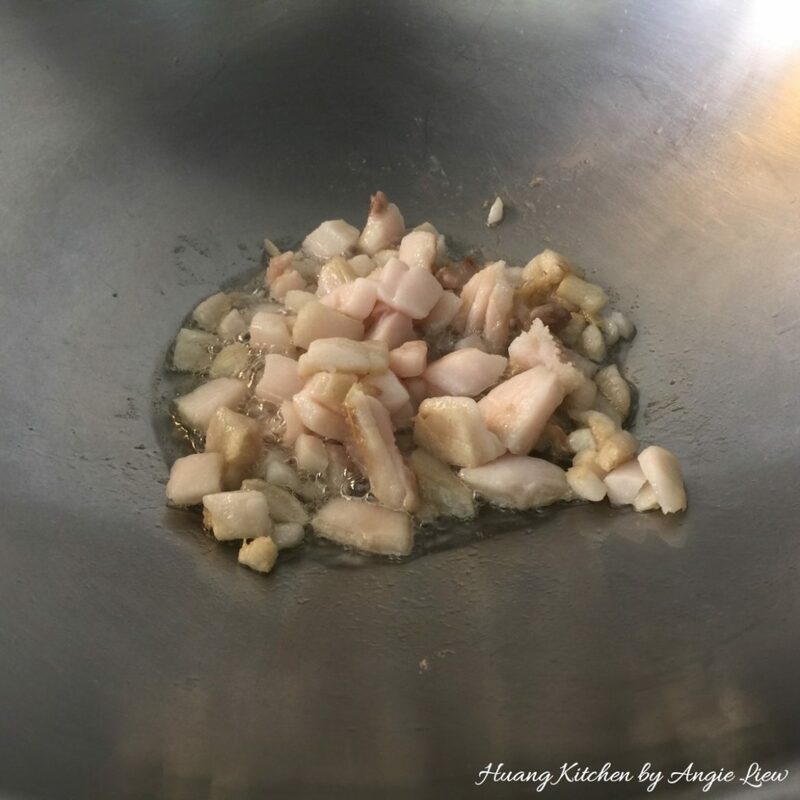 You can choose to add a little water in the wok before adding the pork fat as this will prevent the fat from sticking to the bottom. Frying the noodles till slightly seared may take a while. However, this is a crucial step before adding the vegetables. The longevity noodles should first be stir-fried alone and is lightly oiled so that they don't clump together in the wok. This also make the noodles taste so much tastier. Ensure that you only add garlic oil and not the fried garlic when you fry the noodles in the wok. Otherwise, the noodles may taste bitter. That's why its best to strain the oil after frying the garlic. There is no need to add any seasoning as the noodles itself is already quite salty. You can choose to rinse the blanched noodles in cold water once or twice or thrice, depending on how salty you prefer the noodles to be. Teochew noodles are available in most Asian grocery shops. 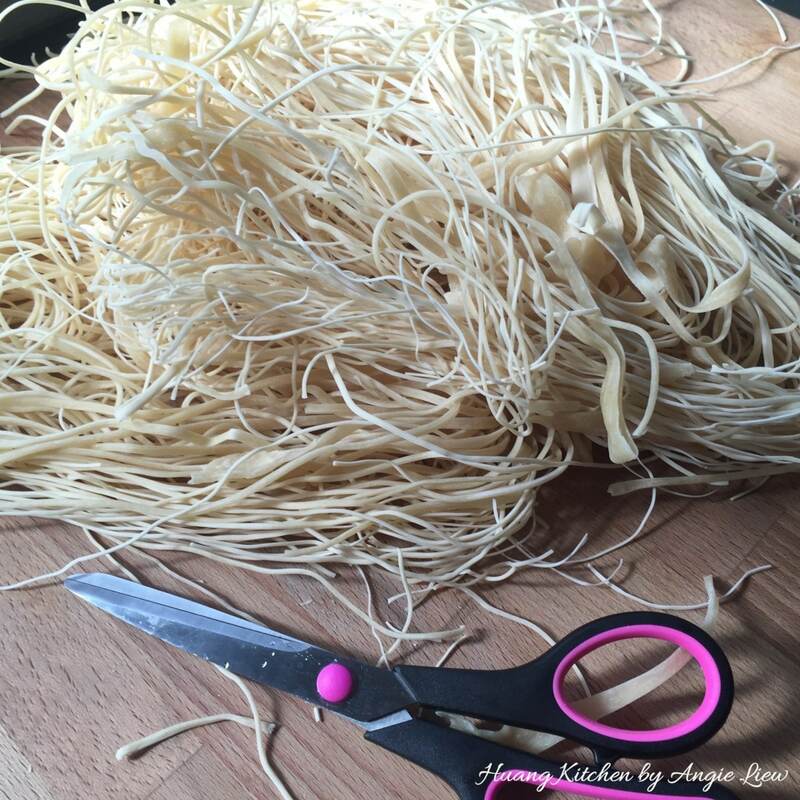 They come in 2 forms, handmade (the strands of noodles are uneven) and machine made (the strands of noodles are of even size). Try to buy the handmade ones as the texture tastes better.